Bright Kholinani Ndebele also known as Gangalee was born in Bulawayo in the beautiful country of Zimbabwe, moved to Johannesburg, South Africa at the age of four. A qualified electrician, a father of three and an owner of a production company which does recordings, publishing, management and marketing of reggae artists. He was baptized Gangalee – a positive rude boy – at his musical rebirth. His third album GANGLEE RIDDIM FOR THE WORLD features various artists from Jamaica to Zimbabwe. The album was recorded in Gangalees’ studios, engineered by Richard Brown and Chris Kel and mastered by Spider man at anchor media Kingston Jamaica. 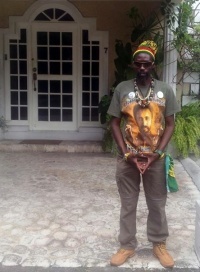 Ganglee travelled to Kingston Jamaica to master the album . The album features Capleton King of fire, Jah thunder, Lutan fyah, Jah Gideon, Kevin Jah Firey (Jamaica), Music client (Zimbabwe), Black Dillinger, El Supreme and the local artist Muzzle Menelek. Therefore the albume. Ganglee has a slot on Thetha FM Community radio station in Orange Farm, a show called Friday Jamboree that caters for reggae and dancehall lovers in the Region G area and the Vaal Sedibeng area. His other radio show “Reggae on the waves” broadcast every Tuesdays on an internet radio station called Prosound LIVE. When he was fifteen his love for reggae took over his life as he learnt how to toast and now he has become a songwriter and a composer and Studio owner. He has worked with established names like Papa Noise, Mud Daddy, Cary Ma, Zwesh fi Kuksh, and the legendary Jah Crucial. ‘To me music is a mission and not competition music is a lifetime investment because generations to come will be listening and playing our music.’ Gangalee. Organised The battle of the Dj’s featuring the best of Gauteng’s upcoming ghetto youths, toasters and poets. Launched Jamaican superstar I-MARA’s album (Don’t take it personal) with Cool Spot Production and Roots Rock Music. Performed at the Bassline as guest artist for the live recording of Cameroon reggae singer Ankias Vallyman’s dvd in 2012. Hosted the first ever Music Unite Cape Town international Reggae Fest in Cape Town at blue waters beach featuring Capleton (Jamaica) with All Nations in December 2012, where we saw 14 of Africa’s reggae artist from Cameroon, Zimbabwe, Uganda and Congo bless Cape Town. Toured Jamaica for two weeks to master the album called Gangalee Riddim for the world.